Today’s Mercedes Benz C36 AMG was originally built to challenge BMW’s M3 and is one of only 200 that were ever imported to the U.S. to do so. Your challenge is to decide if this low-mileage example is Nice Price or Crack Pipe. There wasn’t much question as to which of those options was bestowed on Friday’s custom convertible 1990 Lincoln Mark VII, at least not after reading all the brutal comments. Sure enough, it dropped faster than Rhonda Rousey with a 70% Crack Pipe loss, yet another ignominious feather to stick in Lincoln’s sad cap of failure. That Lincoln was at least an LSC, which stood for Luxury Sport Coupe and not, as many astronomers may have thought, Local Supercluster. A lot of manufacturers like to anoint their sportier rides with two or three-letter acronyms to identify their greater aspirations. BMW of course uses two, the letter “M” and the class number, for theirs. Mercedes uses three, AMG, which surprisingly doesn’t stand for the German equivalent of Always Be Closing from Glengarry Glen Ross. Instead it’s taken from Aufrecht, Melcher (the original founders) and Großaspach which is the town in which Aufrecht was born. Now, as we all know, AMG was originally an independent tuner and builder of racing engines. Once BMW had established their in-house M werkes however, Mercedes felt the need to compete mano-a-mano and brought AMG under their wing by first partnering with them, and then buying them. 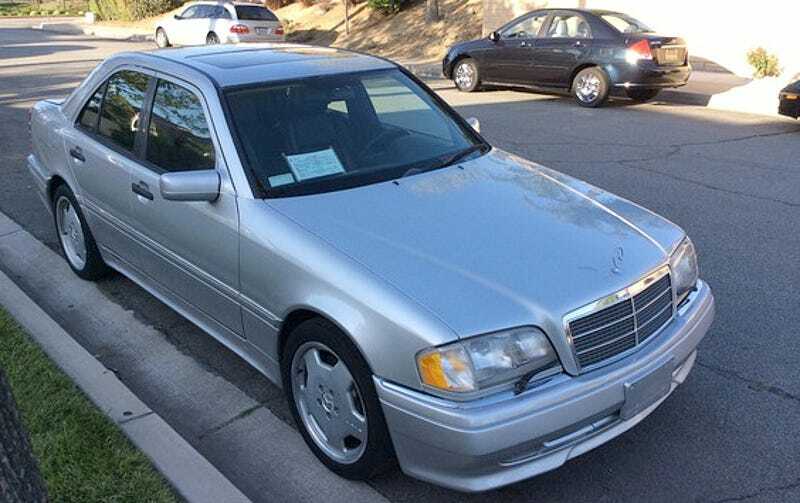 One of AMG’s Hottentotten models was the W202-based C36 which the company offered between 1995 and 1997 and of which only about 5,200 were ever built. Out of those, only 200 were shipped to the U.S. of A., and this silver over black edition is one of the ones that made the trip. Power for the C36 comes from a hand-built 276-bhp edition of Mercedes’ M104 bumped up to 3.6-litre displacement. The bigger pots are by way of a 2.1mm over-bore and the engine gained better intake and exhaust breathing as well as a hotter cam so as to make all those ponies as well as a healthy 284 lb-ft of twist. The only gearbox offered on the U.S. cars this year was Benz’s 722.4 four-speed automatic. Other mods over the non-AMG cars included a suspension with firmer spring rates and a 25mm drop, as well as a body kit that supposedly makes the car a better freeway flyer. This one hasn’t flown on all that many freeways apparently. It comes with only 84,000 miles on the clock and looks to be in great shape for it. The bodywork and badging all look to be intact, and it rocks appropriate AMG pizza pie wheels and Mercedes’ hypnotic single articulating windshield wiper. Love those! The visual cues on the AMG are subtle, and just as no one in space can hear you scream, no one will hear you laughing maniacally was you pull away from them in what they mistakenly thought was a plain jane C-Class. While you’re having your hoot you might notice that the interior looks to be in fine shape as well. The W202 was one of the first cars where Mercedes started cutting corners in the quality department. However, aside from some discoloration on the passenger seat squab (dammit, Taco Bell!) and an aftermarket radio, there doesn’t seem to be anything other than minor wear in here. Oh, and before you start complaining about someone having accidentally dipped the steering wheel in their extra grandé vanilla latté, that’s how AMG spec’d them, black on top, and white on the bottom. The seller is asking $5,800 for the car, and claims that it runs great and has ice cold A/C. What more could you want right? Well, what you might want is to hold out for this car’s successor, the C43, which replaced the 276-bhp six with a romper-stomper 302-horse 4.3-litre V8 which also came with 302 lb ft of torque. That car benefitted from an AMG-tweaked five-speed auto and brakes from the larger E55 AMG as well. Or, you could stick with this one, which does sport more horses than the same model year BMW M3, if not that car’s aggressive handling capabilities. Hmmm, decisions, decisions. Well, while you’re mulling over what to buy, take a moment to let us all know your opinion as to whether someone should buy this ’95 C36 at the price the seller has set. What’s you take on that, does $5,800 seem like a deal? Or, is that a price that’s more OMG than AMG? Inland Empire CA via AutoTrader, or go here if the ad disappears.